The bones of King Richard III were found beneath an English parking lot. So, we brought "Richard III" back to life in a parking lot. The Drilling Company presented Shakespeare's tragedy of the crook-back king August 1 to 17, 2013 as the concluding production of the season. Hamilton Clancy, Artistic Director, directed and Alessandro Colla was featured as the king. L: Arash Mokhtar as Buckingham, C: Alessandro Colla as Richard III (the crookback king), R: Ayo Oneké Cummings (a Murderer). Photo by Jonathan Slaff. The company was inspired to interpret the play as a reflection of the political tides of conflict that are sweeping through our government centers now. "The current climate is as acrimonious as the War of the Roses," maintains Clancy. The impulse was to interpret the play as a sort of modern political fable. That view, and the resultant yearning for political reunification, was also front-and-center when the company chose to do "Cymbeline" this season (July 11 to 27), a play that portrays a divided world that is magically healed. 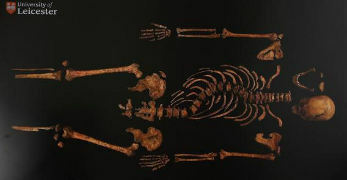 Recently, there has been a re-examination of Richard III's legacy, with academics pointing out exaggerations and false claims made about him since the Tudor era. Has this modified the Drilling Company's interpretation? Hamilton Clancy explains, "We are not contesting the play's nature as a melodrama of glitter and violence, but we are focusing on how Richard's character helped force the political power shift of his time and how his political opportunism furthered his own personal destiny. That has incredible resonance today as we view our modern political figures." Richard was, above all, a political animal. One of his first acts--the keystone of his "contract"--was to outlaw unpopular taxes, yet his largesse bankrupted the realm and he needed special taxes the next year. He eliminated political opponents ruthlessly. Cloaking all his actions in the guise of morality, he staged his prayers and surrounded himself publicly with clergymen. He stifled dissent through censorship and had one satiric poet killed. Does any of this sound familiar? Richard was played by Alessandro Colla, who played Hamlet in the Parking Lot in 2011 and who played the Woyzeck character in the Drilling Company's production of "Reservoir" by Eric Henry Sanders in 2010. Coincidentally, Colla is the height that Richard III's bones suggest he was. The cast also included Sheri Graubert as Margaret, Kristin Johannsen as the Duchess of York, Veronica Cruz as Elizabeth, Arash Mokhtar as Buckingham, Aaron Scott as Clarence, Leila Okafor as Anne, Bill Green as Edward, Paul Guskin as Hastings, Valerie Redd as Stanley, Shane Mitchell as Rivers, Jenna Bosco as Catesby, Rachel Weekley as Prince Edward, Michael Bernstein as Grey, Lauren Young as Catesby, Ayo Oneke Cummings a Murderer, Vince Reese as Tyrrell and Joe Clancy as The Boy. Set design was by Jen Varbalow. Left: Vince Reese (Tyrrell), Sheri Graubert (Margaret); Center: Alessandro Corazzi (front-Richard III), Aaron Scott (behind-Clarence), Right: Veronica Cruz (Elizabeth). Photo by Will Gutierrez. The production was dedicated to the memory of the late Richard A. Harden (d. 2011), a director of The Drilling Company who loved theater that posed political questions. He had been intent on directing "Richard III" in the Parking Lot. When the skeleton of the actual Richard III was unearthed in Leicester in February, "It made it obvious that all the signs were pointing to doing it this year," says Hamilton Clancy. The challenge, then, was "how 'Richard III' would be politically meaningful to us now." 2013 Shakespeare in the Parking Lot season opened with "Cymbeline"
Hamilton Clancy, Artistic Director of The Drilling Company, chose "Cymbeline" as the opening show of the 2013 season of Shakespeare in the Parking Lot because it portrays a divided world that is magically healed. The play is a hopeful fable to invoke at a time when the world seems so irrevocably torn, with our own country so polarized and the Middle East ripping itself apart in hopeless religious conflicts. Performances were July 11 to 27 in the Municipal Parking Lot at the corner of Ludlow and Broome Streets. "More than any other Shakespeare play, the themes of unity come through in the final act of the play," says Clancy. "That is why it seemed like the play to do right now." "Cymbeline" has a complex, not a simple narrative, and is sometimes classified as a problem play because it is part history, part tragedy and part comedy. The marriage of Imogen and Posthumus is tested in the context of a rebellion of the Britons against the Roman Empire. King Cymbeline blunders in his relationship with his own wife and is led into a seemingly iremediable error in statecraft: he makes an impulsive and needless war on the Roman Empire. In the end, through a difficult but (in its context) believable series of actions, the tangled plot resolves itself with reconciliation and forgiveness. Everyone receives a just reward: the villains die, Imogen and Posthumus are reunited, the British kingdom survives and the Romans are defeated but their lives are spared. In the love affair of Imogen and Postumus, and its testing by Iachimo, "Cymbeline" is also one of Shakespeare's most romantic plays. Since the birth of blockbuster space sagas, many of our culture's most romantic stories have been set in future centuries with republics battling empires. Hamilton Clancy, Artistic Director of The Drilling Company, wanted to experiment with synthesizing the two genres and says, "It occurred to me that futurism is pretty much the modern day language for romantic storytelling." Thus was born his idea for a futuristic, space-age production. He notes that Imogen's story fits the pattern of narrative identified by Joseph Campbell as The Hero's Journey, which is also the center of other futuristic mythologies. He adds, "Within the landscape of the parking lot, we are always on asphalt. That makes us look like we are on one moon or another." CAST WITH LIGHT SABRES -- L-R: Mary Linehan, Skylar Gallun, Anton Rayn (Philario), Keldrick Crowder (King Cymbeline), Amanda Dillard (Imogen, front), Andrew Marker (Cloton), Lukas Raphael (Posthumus). The actors included Amanda Diller as Imogen, Keldrick Crawford as Cymbeline, Mark Byrne as Iachimo, Lukas Raphael as Posthumus, Carolyn Popp as The Queen, McKey Carpenter as Guiderius, Andy Markert as Cloton, Anton Rayn as Philario, Jonathan Eric Foster as Pisanio, Sajeev Pillai as Cornelius, David Sitler as Belarius and Adina Bloom as Aviragus. The ensemble included Haley Simmons, Skylar Gallun, Mary Linehan, Louisa Ward, Lexie Tompkins, Angie Fontain and Michaela. Puppeteer is Anton Rayn. Costumes were designed by Lisa Renee Jordan. Set design was by Jennifer Varbalow. Read our review in The New York Times.